GreenWorks was hired by PacTrust to design a new nature play area within the Columbia Tech Center in Vancouver, Washington. Columbia Tech Center is a 410-acre mixed use development that includes a 12-acre park that promotes a live-work balance for the community. The new 25,000 square foot playground will become the heart of the park and will be a significant amenity for the development. Once complete, the playground will be a destination for children in Vancouver and the entire metro area. The design for the playground encompasses a broad spectrum of play experiences for children of all ages and abilities including a sand and water play area, boulder and log climbing, a large mound with a climbing tower, embankment slide, and rope bridge, and a discovery area with trails, musical instruments, log fort, and densely planted mounds so children can imagine they are in a forest. The ultimate goal of this project was to create a vision for the iconic and historic Multnomah Falls site to improve safety and access issues from Interstate 84, to amend pedestrian access and visitor experience of the site, and to re-connect the Multnomah Creek with a natural confluence to the Columbia River. With multiple stakeholders, including the U.S. Forest Services, Oregon Department of Transportation (ODOT), Oregon Parks and Recreation Department (OPRD), the Columbia River Gorge Commission and the Columbia Estuary Partnership. GreenWorks led a multi-disciplinary team to master plan and develop a vision for the future of Multnomah Falls as a new gateway experience of the Gorge. The design team provided conceptual design, master planning, visual analysis, and a circulation Study. The team developed the concept around a comprehensive reconfiguration of the Interstate 84 Multnomah Falls interchange with a new full interchange design and access to Benson State Recreation Area and bridge crossing of Multnomah Creek. The Vision Plan includes a daylighted and restored Multnomah Creek with a natural alluvial fan to the Columbia River for fostering chum salmon habitat. Crown Park is a cherished community park in the heart of a historic neighborhood of Camas, Washington. The 7-acre park is home to many mature fir trees and outdated infrastructure including a 1950’s outdoor swimming pool. 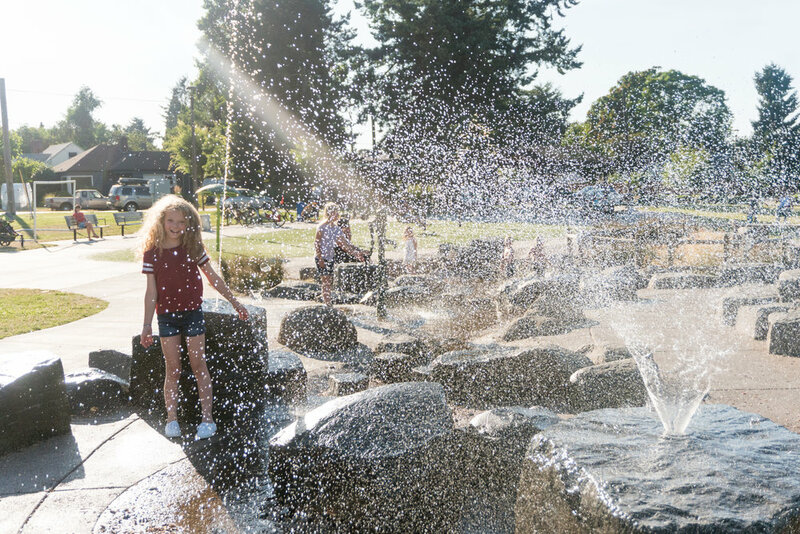 The City of Camas hired Greenworks to assess the existing pool and park features and create a new Master Plan for Crown Park that will guide potential redevelopment for the next 20 years. Elements of the planning focused on economic studies for repairing or replacing the pool and updating park features including: replacing old paths with new accessible sidewalks, creating a universally accessible destination playground, incorporating an amphitheater for outdoor movies and concerts, placement for a new permanent restroom, multi-use sports court, a picnic shelter, places for sitting, and flexible open space. GreenWorks was hired by The Port of Camas-Washougal to design a new nature play area adjacent to the Columbia River. The play area will be a highlight along a mile-long trail that begins at Washougal Waterfront Park and meanders along the shoreline of the Columbia River. The design for the playground will encompasses a broad spectrum of play experiences for children of all ages and abilities using natural materials to encourage physical, social, and exploratory play. 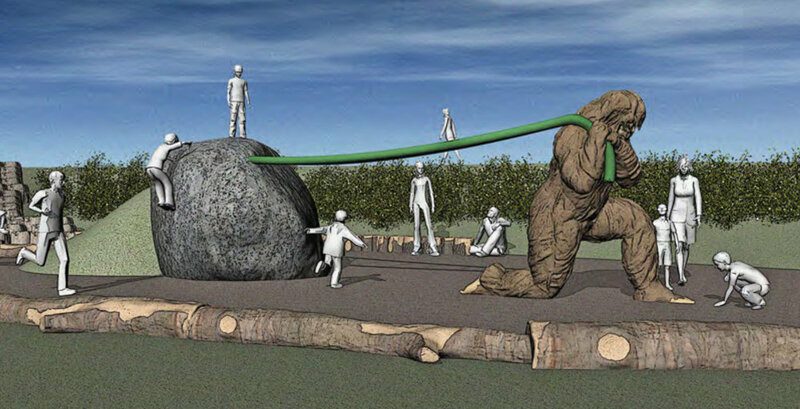 The focal point of the play area will be a large erratic boulder nicknamed “Erric the Erratic” which is a remnant boulder from the Ice Age Floods. Other components will include an embankment slide, musical instruments, log climbers, and a discovery trail that winds through the forest. The Conceptual Design Alternatives were recently prepared and presented to the Port with final concept completed in January of 2017. Newell Creek Canyon is 233 acres of protected natural area in Oregon City and Clackamas County along Hwy 213. GreenWorks has been hired by Metro to refine the design, document, and permit a day use area and multi-use trail system within the canyon. GreenWorks is working with Hart Crowser Geotechnical Engineers to assess the requirements for improvements within the Geologic Hazard Overlay Zone and Cascade Environmental for mitigating impacts in the NROD and vegetated corridors of wetlands and streams. The team also includes KPFF Structural and Civil and Sentiaros as the Mt. Bike Advisor. The project is currently at the Land Use Review stage and is proposed for construction in 2018. Hogan Butte is a 43 acre park south of downtown Gresham and west of US 26. 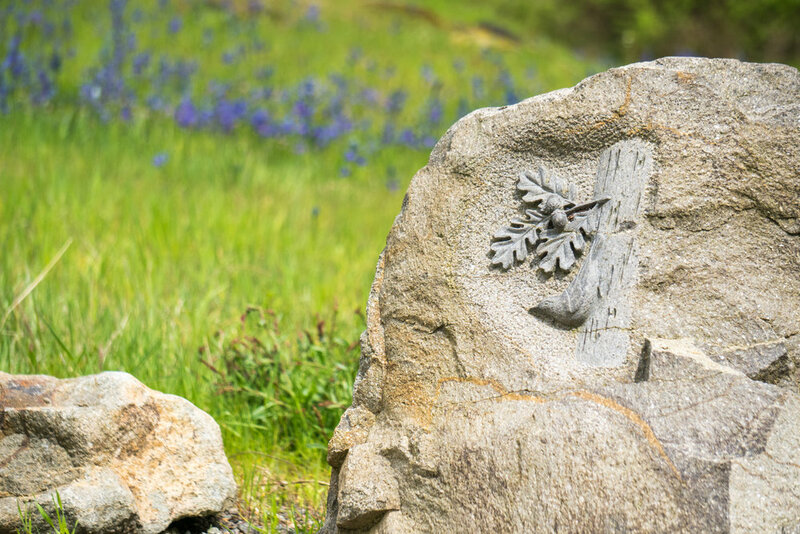 Hogan Butte has a rich natural history that is highly visible on-site and from the stunning 270 degree views from the top of the butte (with views of Mt. Hood, Mt. St. Helens, Mt. Adams, Mt. Rainier, the Columbia River Gorge and the City of Gresham). The position of the property and connections into the community provide unique opportunities for public access and education. GreenWorks developed the Master Plan for the site, which recognized the unique value of the Hogan Butte site, both as a natural asset and community asset. The Master Plan meets community assessed needs and protects the natural environment. Program elements included: protecting and restoring natural resources, providing public access, appropriate infrastructure such as restrooms and parking, trails, signage and education. Hogan Butte has a rich natural history that is highly visible on-site and from the stunning 270 degree views from the top of the butte. The position of the property and connections into the community provide unique opportunities for public access and education. On the Deschutes River, the Colorado Avenue Dam maintains water surface elevations upstream in the Mill District, but is located in an area of the river that is heavily used by boaters, kayakers, and tubers. Prior to this project, the dam and footbridge configuration blocked downstream passage and required all river users to exit the river and portage around the impediment, exposing a high number of low-skilled users to the potential of being swept into the dam. A team that included GreenWorks designed this project to provide safe passage over the existing dam. 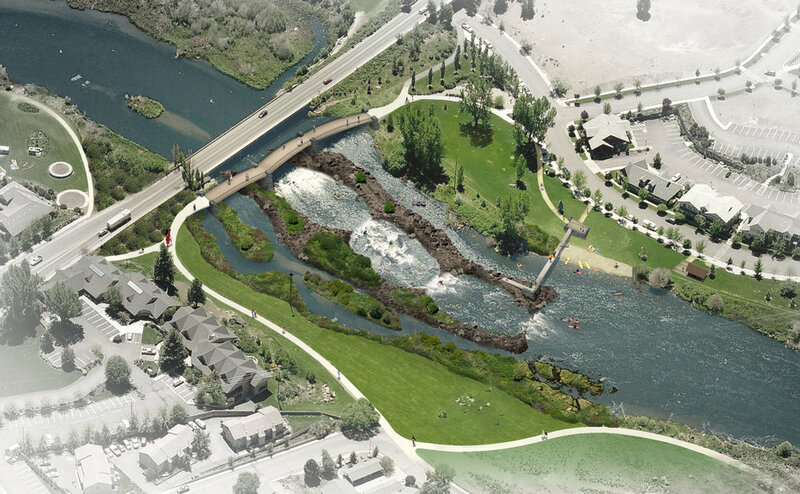 In addition to the in-water recreational components, the design includes increased habitat diversity along the river by incorporating fish passage and on-bank habitat restoration, design improvements to McKay Park, and replacement of the pedestrian bridge. The project is made up of three distinct channels: Passageway Channel with modest rapids; the center Whitewater Channel with four wave features for more experienced whitewater enthusiasts; and the Habitat Channel, with no public access, provides habitat to local and migratory wildlife. Opened in 2015, the new Bend Whitewater Park enhances recreation by allowing river users to travel through the dam without having to portage and improves riverfront habitat in an ecologically sensitive area. Khunamokwst Park is a new park in the Cully neighborhood. As one of the most economically and racially diverse neighborhoods in Portland, the project required an approach to public involvement that was broad, innovative and inclusive. In addition to the development of a Project Advisory Committee (PAC) and open houses, outreach was extensive and included diverse stakeholders and community members. For each engagement activity, materials were bilingual, a Spanish speaker was available, and additional outreach was done to share the designs with organizations within the Latino Community. GreenWorks provided outreach to neighborhood children and used this project as a platform for teaching them about landscape architecture, public process, and construction. We partnered with community nonprofit organizations Verde and Hacienda’s Expresiones after-school program to engage a group of 5th, 6th and 7th graders in the process. GreenWorks received the Oregon Community Trees Organizational Award for Outreach for this project’s innovative public engagement. This 2.5-acre park represents a new era of inclusive parks and has something for everyone. Park features include a small beginners skatepark, play areas that include traditional and nature-based play elements, interpretive art, small prefabricated restrooms, accessible looped pathway with seating areas, and flexible open space. The park includes many sustainable features, including water conservation, drought-tolerant planting design, efficient irrigation design, native or native-adaptive plant material, innovative stormwater solutions, energy efficient lights, use of recycled materials, local materials from vendors, and an eco-roof picnic shelter. The Westmoreland Nature-Based Play Area is a pilot project for Portland Parks and Recreation. GreenWorks collaborated with Portland Parks & Recreation to replace an outdated playground with a nature-based play environment. GreenWorks focused on developing a context-sensitive design that would reference the specific characteristics of the site and its surrounding community. Extensive outreach was built into the design process. GreenWorks led a comprehensive public involvement and consensus building process that resulted in unique play elements, which were custom-made for this park that celebrate the community’s vision. The design team included environmental artist, Adam Kuby. Adam collaborated with the design team on the overall conceptual design of the playground that represents the restoration of the adjacent Crystal Springs. He helped envision these artistic elements as play features within the design. Sustainable features include water conservation, drought-tolerant planting design, efficient irrigation, native or native-adaptive plant material, sustainable stormwater management, incorporation of salvaged concrete repurposed for water play elements and many salvaged logs for climbing features and custom benches. This project opened in 2014 and is “wildly” popular with children and adults alike. The project was awarded the ASLA Oregon Honor Award. Fairview Woods Park is a renovation of an existing open space to a neighborhood Park and an example of where we successfully used a sustainability filter to improve park conditions and facilities. Some trails and interpretation existed at the park but graffiti, inappropriate park use and gunfire were common in the park and neighbors were concerned about safety. GreenWorks and SWCA environmental developed a conceptual plan and construction documents to address park safety and upgrade facilities to meet neighborhood recreation needs and provide access to wetland and riparian areas. We also addressed creek and wetland protection and sustainability on site by including native plant community restoration, vegetation management to provide visual corridors, minimal tree removal, use of downed woody debris for interpretive and plaza features, wetland trail improvements, trail decommissioning, minimized parking including ADA space, and upgraded trails to meet ADA standards. 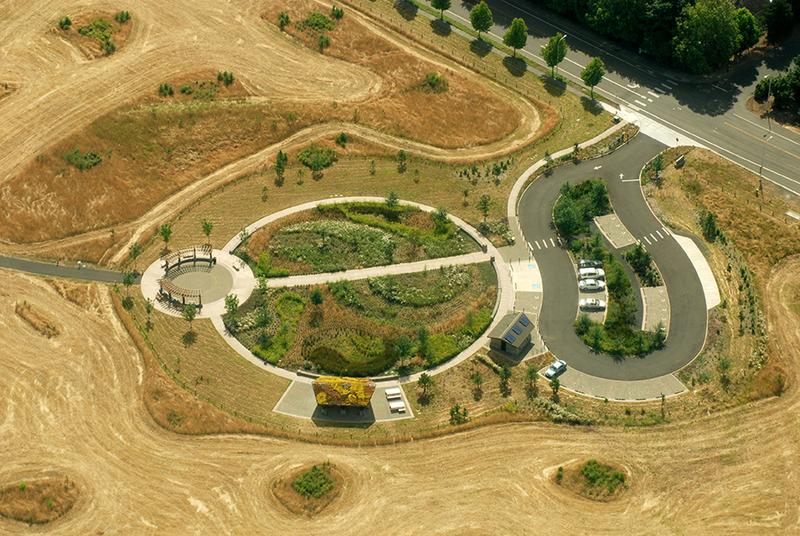 GreenWorks provided master planning and design services for the waterfront park in Hood River. The 6-acre park lies north of downtown between the Hood River Event Site and “The Hook” (a protected harbor for learning windsurfing) on property donated by the Port of Hood River. 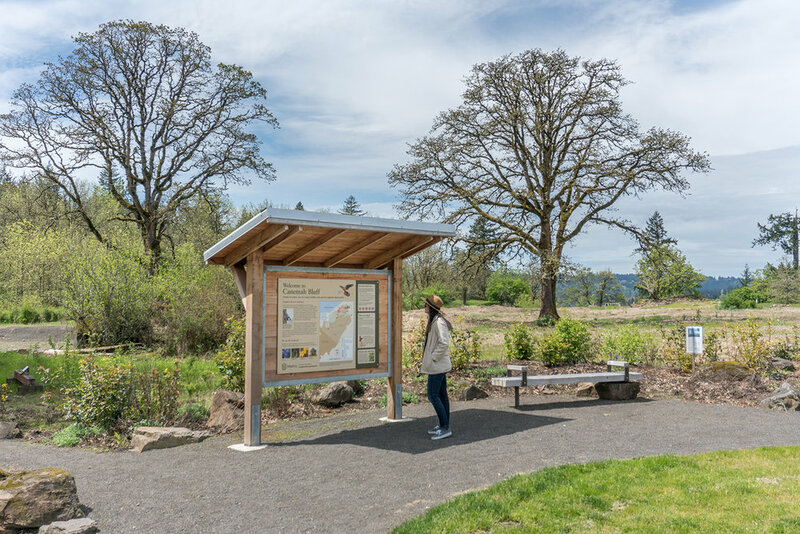 The Park helps connect the community to the Columbia River through a family-friendly public gathering space that accommodates a wide spectrum of uses. Our team went on to provide design services. 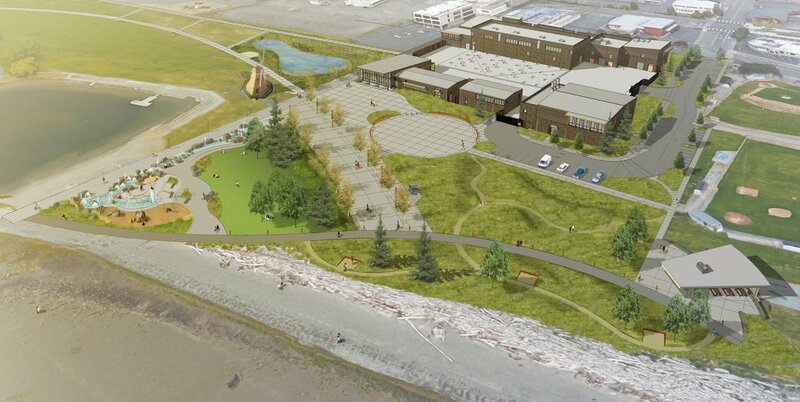 Design features include beach and swimming access to the Columbia River, innovative children’s play facilities, and flexible areas for large community events and festivals. In addition, the park reclaims eight hundred feet of riverbank, laying back the slope and restoring the river’s edge with a wide variety of native riparian plants. The park sits north of commercial use sites to the south and has improved connectivity to the waterfront and increased economic development and commercial revitalization. The Windjammer Park Integration Plan is a long-term plan, integrating existing and new program elements in this 28.5 acre waterfront park that includes a popular RV site, playground, lagoon, trail network, and waterfront access. GreenWorks worked closely with the City of Oak Harbor and a community advisory group on developing three park concepts, which led to the preferred alternative. During the process GreenWorks participated in two open houses. Public involvement also included an online open house to solicit comments from the public on the three options. The input received assisted with devising a preferred concept. The final concept included the renovation of the swimming lagoon, improved pedestrian walking trails, reconfigured parking lots, new events plaza and splash park outside the facility, as well as a performance stage, new playgrounds and multi-use fields. The Windjammer Park Plan is expected to be implemented in segments over time, and GreenWorks developed the phasing plan to guide the future programming of the Park. The Integration Plan was adopted by City Council in May of 2016.